The Panasonic Lumix TS1 is a tough, go anywhere camera that is water and dust resistant as well as tough enough to drop from 5ft. Its set of features and image quality put it at the top of the list for a tough, compact camera, as does the price. Read more in our Full Conclusion. 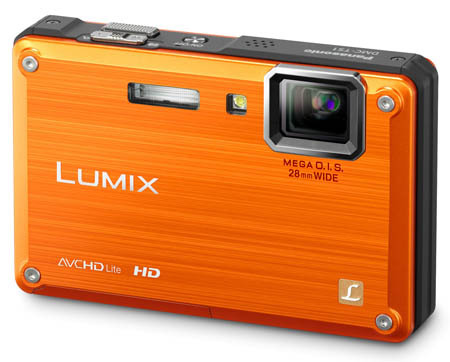 Panasonic's Lumix DMC-TS1 is a"tough", rugged camera that allows the user to take and operate it anywhere. This camera has a waterproof (3m/10ft. ), shockproof (drops from 1.5m/5ft.) and dustproof rating, which allows you to take it anywhere, into just about any situation without worrying if the camera will be OK or not. It features a 12-Megapixel imaging sensor, 4.6x wide internal optical zoom lens, Panasonic's MEGA O.I.S. optical image stabilization system and a 2.7-inch LCD screen. The TS1 is also the world's first "tough" camera to feature AVCHD Lite high definition video recording. AVCHD Lite allows the camera to capture high-quality HD video with a higher compression, taking up less space on your memory card. The Panasonic Lumix DMC-TS1 is available now with a MSRP of US $379.95.